constantly remind you of God's Word and His faithfulness. People throughout the world have enjoyed these plaques for more than 70 years. These antique looking plaques, designed by the late Andrew E. Mitchell in the 1920's and 1930's, are still produced today from his original carvings. The metal plaques are made of durable cast aluminum so they will not chip or break. Individually hand-painted, Mitchell Art plaques are air-brushed in antique gold with your choice of either "blue" or "bronze" background. Delicate flowers and other designs are decorated in soft tones that blend with the background coloring. 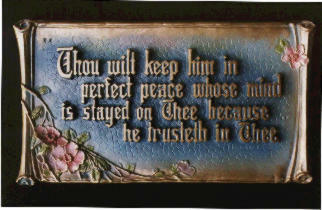 You may choose from 79 different Mitchell Art plaques. They make wonderful gifts of encouragement. You may order your plaques by mail, telephone, or e-mail. Retail prices do not include shipping or handling. and to enjoy our new look coming soon.